The busyness of spring sports makes healthy dinners hard to come by. Many nights are “eat and run,” and I admit I have fallen victim to Subway hoagies a couple of nights already. Creating quick, portable meals that have some semblance of “healthy” is difficult. Due to early practices, I often eat my dinner at the practice because I don’t want to eat dinner at 4:30 or wait until 7:30. Also, I need to consider making a meal that doesn’t need to stay hot because my husband and my other son will eat later while I and my soccer player are at practice. Not to mention it needs to be “light enough” that my soccer player can eat it before practice without feeling stuffed. Phew! A lot of criteria to consider! I have relied on egg salad sandwiches and roast beef wraps in the past but wanted to expand my horizons on this front. 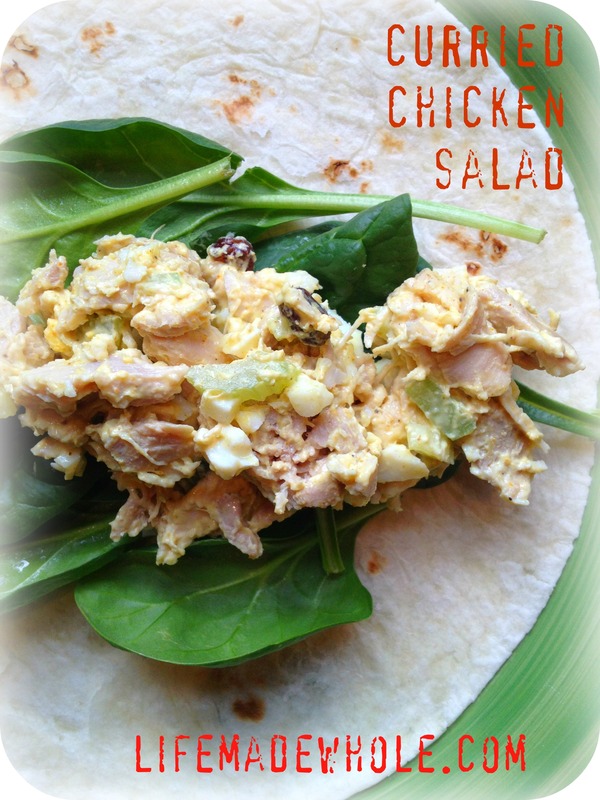 Due to the success of my egg salad made with Greek yogurt, I ventured onto chicken salad using Greek yogurt and I have to say….I think I like it even better than the egg salad! The first time I made chicken salad, it was really plain – just chicken, Greek yogurt, salt and pepper. My husband pointed this out to me (very lovingly, of course.) I acknowledged the lack of excitement in the chicken salad and said I would do better next time. So — here is better! on a bed of spinach. Add a tomato if you would like! ** i love raisins in this but my son and husband didn’t. use your personal preference. This entry was posted in Food and tagged chicken, greek yogurt. Bookmark the permalink. Looks delish! Just made a sweet cranberry pecan chicken salad with greek yogurt! Check it on our blog. Thanks for sharing! I will check it out. Thanks for the comment. Don’t you just love greek yogurt?? ?